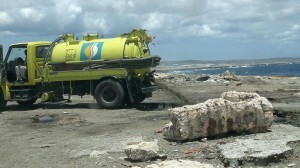 WILLEMSTAD - Uncontrolled discharge of wastewater into the sea at the 'Shut' site will stop this year. That assures the Minister of Traffic, Transport and Spatial Planning (VVRP) Zita Jesus-Leito. The waste processing station at Seru Fortuna must, therefore, be put into use in the short term. This installation, built in 2016, consists of underground tanks and a pump that has to send the water to the sewage treatment plant at Klein Hofje. The trucks arrive at Shut with a mix of household waste and sewage, chemical (liquid) substances and oil and fats. They picked these up at different locations. At homes, but also at restaurants and dry cleaners. The intention is that the trucks will not discharge industrial wastewater at the installation. Until recently, this was impossible to check, now there is equipment for this. Trucks that do come with such water at Seru Fortuna are returned and have to discharge the waste elsewhere. For oil and grease they can go to another installation at the asphalt lake, says the minister. She admits that there are no adequate provisions for the removal and processing of oil and grease. Staff need to be recruited for the waste processing station and guidelines will be issued for the companies that discharge the water. United Nations for Office Project Services, UNOPS, has produced a report with an evaluation. This indicates what further needs to be done to stop the discharges at Shut.